If you’re a fan of mythology I’m sure you’ve already figured out what this article is about. For millennia humans have followed different cultures and have practiced diverse religions. However, whichever the culture it might be and how different they may seem from the other, there are always some similarities that make us wonder if all the cultures are branches of the same tree. The question of origin of life and the existence of Gods has dumbfounded the scholars, researchers, philosophers and scientists for ages. In this list we’re going to compare 10 Greek Gods and/or heroes with their best possible match from Indian mythology. Some of the comparisons indicate towards a parallelism between the two cultures, while other comparisons hint towards a direct collaboration/inoculation of the deities/heroes from one culture to another. No matter the thousands of miles’ distance between the two, the parallelism is certainly striking and some fuel to the thoughts. Whatever the culture be and whatever the religion be, it is never complete without love. In the Greek mythology Eros1, commonly known as Cupid (the Roman counterpart), occupies the designation of God of love. The Greek God of love is often depicted in the pictures or statues as a young, handsome male with wings. He is commonly shown to be holding a bow in his hands. It is this bow he uses to shoot people with arrows that makes them fall in love. In a similar manner, Indian mythology also has a position for a love god taken by Kamadeva2. Kamadeva is known by several other names including Manmathudu, Madan, Ratikanta amongst others. 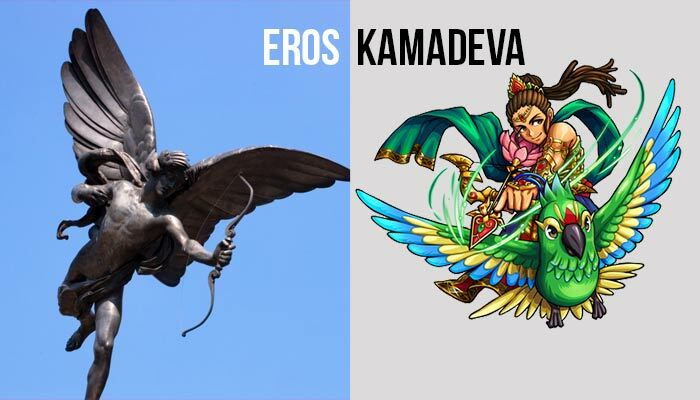 Kamadeva, like Eros, is also known to be carrying a bow made of Sugarcane and arrows of flowers. He shoots humans using this bow to intoxicate them with love. The Indian God of love is either shown as a young, handsome male with wings, or flying on the back of a parrot. Next in our comparison are the two Gods who are so much alike that many believe that they can even be the same person, I mean same God. Though, Hermes is attributed with many departments to control, but he is commonly known as the God of messengers, travels, mischiefs and thieves3. Hermes is known to travel distant places in quick times and show up almost anywhere4. He often plays tricks on others either for his own entertainment or as part of a bigger plan which in the end help humanity. Hermes is also said to have invented astronomy and music among other skills. Also, there’s a famous story according to which Hermes invented a string instrument called Lyre to quench Apollo’s anger. 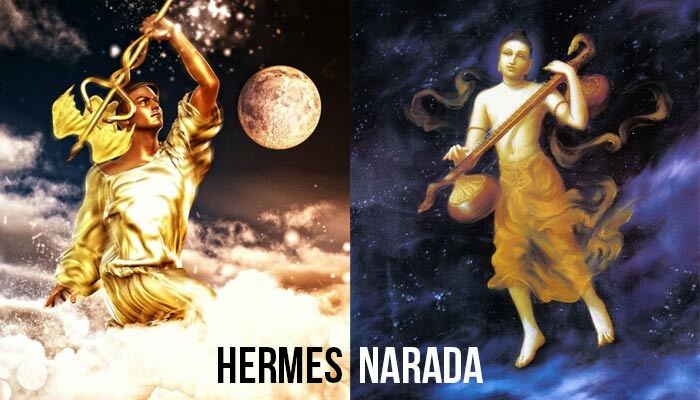 When we take a look at Narada from Indian mythology, he is not much different from Hermes. In Indian mythology Narada is considered as the first Indian postman/journalist/messenger. He can never contain secrets, thus is known to spread news from one place to another5. Like Hermes, he also plays tricks on others triggering a bigger event making his role significant in a great many Indian stories. Also, he is known to travel real fast and show up almost anywhere. In a manner similar to Hermes, Narada was proficient in music and invented musical instrument called Vina. He was also a seer. Well, this one is not really a comparison but a suggestion/theory that the legend of Heracles is actually a result of Balarama and Krishna’s legend incorporated in Greek mythology. It is quite possible that Megasthenes who travelled to India during the reign of Chandragupta Maurya, Maurya Dynasty, after his observation of Indian culture, took back the legend of Krishna (Hare Krishna) which due to language barrier got converted to legend of Heracles6. In the book Indika by Megasthenes, he wrote that an Indian tribe Sourasenoi worshipped Herakles in their land with two great cities Methora and Kleisobora, around the river Jobares. Herakles here clearly refers to Hari Krishna, who was born in Mathura (Methora). Kleisobora and Jobares may correspond to Krishna Pura and Yamuna respectively. Moreover Balarama in Hindi refers to one with enormous strength. Similarly Hercules also refers to great strength. Now, let’s compare the events from their lives. Although there may not be direct correspondence, we can find symbolic resemblance7. Hera sent poisonous snake to kill Heracles when he was a child but Hercules killed them. Also, Hera unknowingly tried to breast feed Hercules, but as soon she knew of his identity she withdrew. On the other hand, a demon Putana was sent by Kamsa to kill Krishna. Putna tried to breastfeed him by poisonous breasts, but was killed by Krishna. Heracles defeated Hydra (second labor), a serpent with multiple heads. 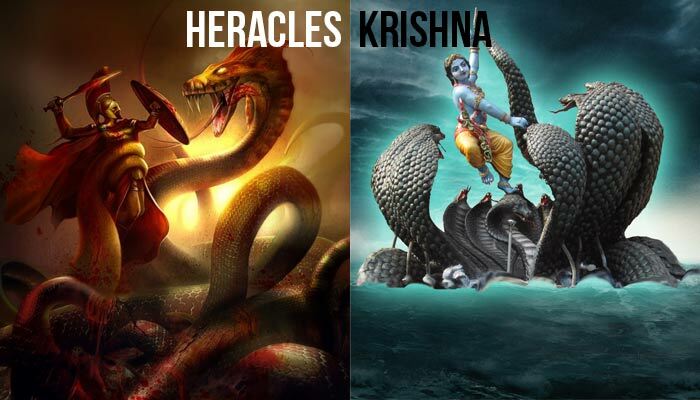 Similarly Krishna defeated Kaliya Nag, also a serpent with multiple heads. Heracles killed man-eating Stymphalian birds with bronze beaks (sixth labor), very similar to Krishna killing Bakasura, a man-eating crane with sharp beaks. Hercules wrestled and captured Cretan Bull, whereas Krishna wrestled and killed a demon called Arishta who attacked Vrindavan in the form of a monstrous bull. Hercules in his eighth labor captured man-eating Mares of Diomedes, which is a little similar to the legend of Krishna defeating a demon Kesi, who took the form of fire breathing horse. Hercules killed earth-born giant Antaeus by holding him in air and squeezing the breath out of him. Krishna also killed a demon Trinavarta by strangling him to death while in air. Apollo is the god of Sun, light, music and prophesies8. Although, the title of God of Sun in also shared by Helios in Greek mythology. But some believes are that Helios and Apollo are same9, while other believe them to be different and since Helios was a Titan, the title of God of Sun passed to Apollo after Titan’s defeat. Both Apollo and Helios10, 11 are often associated with a flying golden chariot which is driven by steeds. In Indian mythology God of Sun is known as Surya. Surya is also known by other names like Aditya or Bhanu. 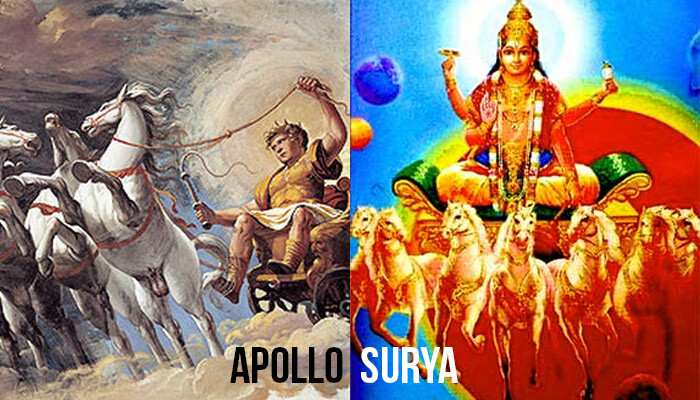 In a manner similar to Helios or Apollo, Surya is also known to ride a flying chariot with seven horses12. Since Surya is not associated with music or prophesies like Apollo, it would be safer to compare Surya with Helios than Apollo, who is the Titan god of Sun. Athena is the Greek goddess of wisdom, skills, war, arts, industry, and justice etc.13. Saraswati on the other hand is the Indian goddess of knowledge, wisdom, learning, music and arts14. 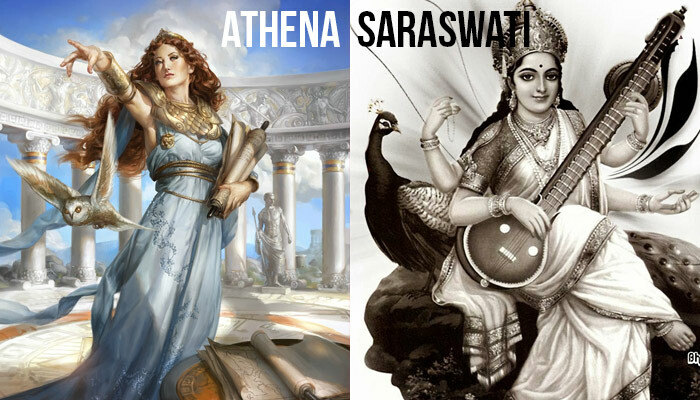 Athena is often seen with her companion owl, while Saraswati is seen with a swan (hansa) or a peacock. Interesting point to note about both the deities is their mode of birth. Athena sprang out fully grown in full body armor when Hephaestus split open Lord Zeus’s skill on suggestion of Hermes to relieve his headache15. It was this nature of birth that Athena became the goddess of wisdom and intelligence. Godess Saraswati sprang out from the mouth of Lord Brahma dressed in white carrying a scared book and a veena in her hands. So, none of them was born the regular way, but from the heads of two prime Gods of their respective religions. However, what separates them both is that being a goddess of war, Athena is sometimes shown carrying weapons and her shield Aegis. On the other hand Saraswati is shown carrying a book, mala (rosary), water pot and veena (a musical instrument) in her fours hands. In Greek mythology Hades is the king of Underworld (where the dead ones go), the god of death and the dead16. 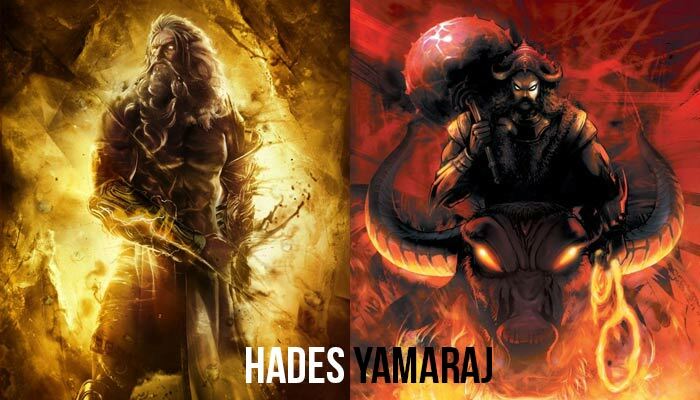 While in Indian mythology Yamaraj is the ruler of Naraka (a place comparable to the underworld) and the god of Death17. Both Hades and Yamaraj are said to bring judgment to the departed souls and accordingly send them to their respective afterlife. Good souls are sent to Elysium and Swarg in Greek and Indian mythology respectively, while the bad ones are sent to Tartarus and Naraka respectively. Hades is the master of Cerberus (three-headed dog18 who guards the entrance of Underworld, while the gates of Yamaraj’s abode – Naraka are guarded by two insatiable dogs with four eyes and wide nostrils19. Next interesting thing is that Hades is also called as Pluto20, especially by the Romans, which is also the name of a planet. The planet Pluto is called Yama in Hindi21. So, even miles apart both cultures named a planet after the similar Gods, a little strange, isn’t it? 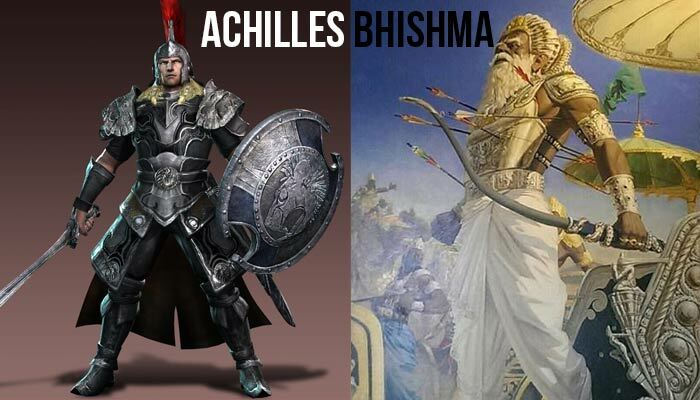 Both of them were heroes in the biggest wars of their respective mythologies—Achilles in Trojan War and Bhisma in Mahabharata. Both of their mothers were river goddesses while father were kings—River goddess Thetis and King Peleus22 of Achilles and River Ganga and King Shantanu of Bhishma23. Now, the tale of birth of both of them is quite similar too. Thetis had six sons prior to Achilles, and while in her attempt to make them immortal she burned them in fire. In the case of Achilles, Peleus arrived in time and saved him by holding him from heel. Thus Achilles lived and got invulnerability except for the heel. However, another version of the story says that Thetis dipped Achilles in River Styx to make him immortal24. Peleus left Thetis after knowing her doings. Similarly, Ganga dipped all her children prior to Bhisma25. Ganga had forced Shantanu to take a vow that he would never question his actions. When she was about to dip Bhisma, Shantanu stopped her from doing so. She left Shantanu as he had broken the vow. Later in his life Bhisma gained a blessing from his father (for giving up his claim to throne so that his step brothers can take up the throne) that he could only die when he wished to die26, thus making him invulnerable like Achilles was. Despite both of them being nearly invulnerable they died as heroes in the respective wars. 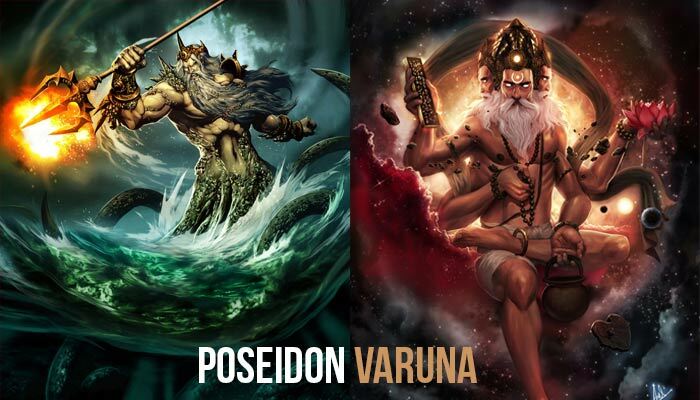 Next comparison is between Poseidon and Varuna. First of all both of them are prominent gods in their respective cultures. Like Poseidon is a major Olympian god, Varuna is a prominent deity of Indian deities (devas). Poseidon is the god of rivers, sea, drought, earthquakes, and horses27. Varuna is the God of water, oceans and aquatic animals28. Thus, their domains are nearly overlapping. Poseidon is often shown riding a chariot driven by horses or hippocampi, while Varuna is seen with chariot of Swan or crocodiles. Both of them have their dwelling inside seas. Parents of Varuna are Kashyapa and Aditi29 who can actually be compared to the parents of Poseidon – Kronos and Rhea27. Kashyapa has given birth to majority of Indian mythological lineages including most of the gods, demons and other races. Similarly, Kronos has also given birth to most of the Greek mythological lineages. Another interesting fact is that Poseidon’s roman name is Neptune20, referring to the planet Neptune which is called Varuna in Hindi21. 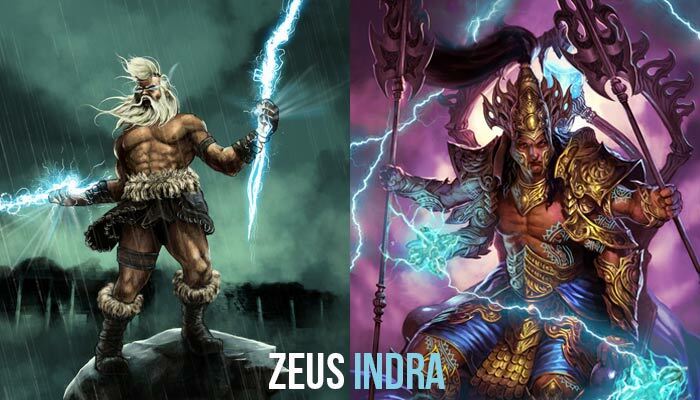 Zeus and Indra make another strikingly similar pair of Gods. While Zeus is the ruler of Olympian gods30, Indra is the king of Indian Gods31. Zeus is the god of sky, and has control over weather phenomenon related to sky and air like storms, tempests, darkness, thunders, lightening and rain30. Indra is also god of rain, regent of the heavens, guardian of the east 31, ruler of cloud and skies32. Another conspicuous similarity is their weapons. Zeus has a thunderbolt as his weapon. Indra has Vajra as his weapon32 which has the same power as thunderbolt. Zeus is known for siring a lot of heroes from different mortal women, and also with different goddesses. And for that reason his wife Hera is jealous of him. Similarly, Indra is also known for his virility and has been unfaithful to his wife Indrani on several occasions32. They both have their dwelling above mountains – Mount Olympus for Lord Zeus and Swarg above Mount Meru for Lord Indra. Zeus parents are also Kronos and Rhea, like Poseidon while Indra’s parents are Kashyapa and Aditi like Varuna. Their parents can also be directly compared between the mythologies, hence making the evidence of parallelism stronger. First of all let’s look at the names. 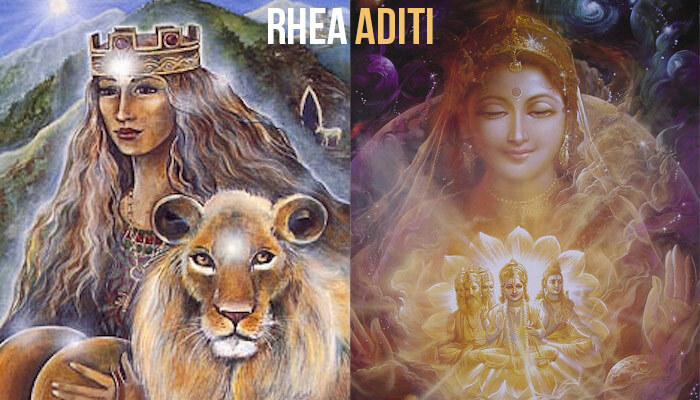 Rhea means “Flow” and “ease”33 while Aditi means “boundless”, “limitless” and “freedom”34. Although not the exact meaning but both the words seem somewhat related. Rhea is the mother of Gods including prominent gods like Zeus and Poseidon and also the goddess of female fertility, motherhood and generation. Aditi is also considered mother of many gods including Indra (Indian counterpart of Zeus) and Varuna (Indian counterpart of Poseidon) 35. Aditi is the goddess of boundless sky and she is also considered the Universal mother, as all forms of life including Gods and Demons are said to be contained in her womb36 (which is drastically similar to Rhea). Rhea was married to Kronos while Aditi was married to Kashyapa who can also be compared to draw a parallelism.